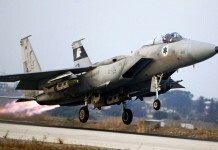 The Israel Air & Space Force (IAF) is conducting a first of its kind multinational exercise at the southern training base of Ouvda this week, where some 60 aircraft from four nations are taking part in realistic air combat training, practicing how air forces from different nations can cooperate in a coalition, fighting for a common goal under one command. The IAF has deployed five squadrons to the base, to practice operations in a coalition environment. For the foreign pilots this exercise provides an opportunity to conduct an intensive training in unfamiliar conditions, operate cooperatively as part of multinational coalition contingency, pursuing common goals, responding to evolving operational challenges. The first Blue Flag is hosting air forces from four nations – the US, Italian, Hellenic and Israel Air Forces. “We look forward to host more air forces in the next ‘Blue Flag’ that, as a biannual event, is scheduled for 2015’. The IAF official said. The exercise spanning over two weeks began with a weeklong orientation for the visiting units, as eight US F-15Es from the 492ns Tactical Fighter Squadron from Lakenheath, UK, four Hellenic Air Force F-16Es from the Hellenic Air Force 340 Squadron (“Asteri”) and Italian Tornado and AMX strike fighters. 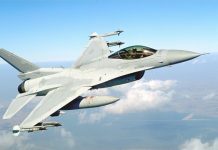 A detachment from the Polish Air Force was also scheduled to participate, but the visit was cancelled few weeks ago over budgetary restrictions. According to a senior IAF official, the orientation provided unique opportunities for the foreign aircrews to train over unfamiliar terrain. 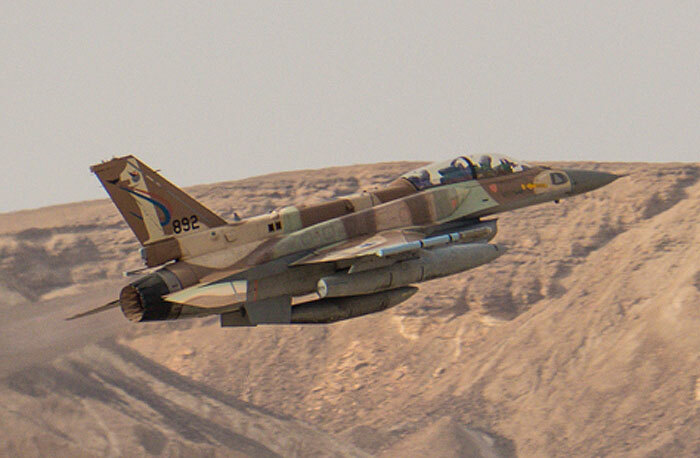 Another benefit flying over the isolated IAF training ranges located in the southern Negev desert is the ability to fly low-level missions, use laser-targeting pods and live munitions on some of the sorties; such capabilities are not common with the crowded European airspace. The Blue Forces are pitted against realistic threat represented by the IAF aggressor squadron, air defense and electronic threat assets operated throughout the southern Negev desert, supporting regular IAF training. The multinational session of the exercise began on the second week, as the visiting air forces along with part of the Israeli units grouped under the ‘Blue Force’ into two teams, flying daily missions against the enemy force represented by the remaining Israeli force. The “Red Dragon” aggressor squadron, along with other IAF units, playing the ‘Red Force’. The Red Force invaded friendly airspace, simulating opposing air forces’ tactics, and attempted to engage specific targets and all approaching aircraft. Their actions called for Blue Force to take action and attempt to eliminate the threat. The combined force merged its tactics, techniques, and procedures that effectively terminated attacks by the adversary Red Forces. 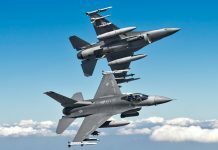 All aircraft – blue and red forces, carry Air Combat Maneuvering Instrumentation (ACMI) pods, configured to match air/air missiles wiring on all NATO combat aircraft, as well as Israel’s fighter jets. These ACMI pods enable all participants to record all flight conditions, combat maneuvers and actions, for post mission a thorough debriefing. 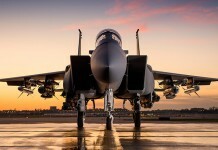 Most jet fighters are also carrying targeting pods and some also employ electronic countermeasures (ECM), to simulate employment of countermeasures against air defense threats. The following video, aired by the Hellenic Air Force shows a ‘Blue Flag’ mission over southern Israel, as viewed from the cockpit of one of its F-16s. Many thanks for David Cenciotti, the Aviationist blog and the Hellenic Air Force for posting it first. 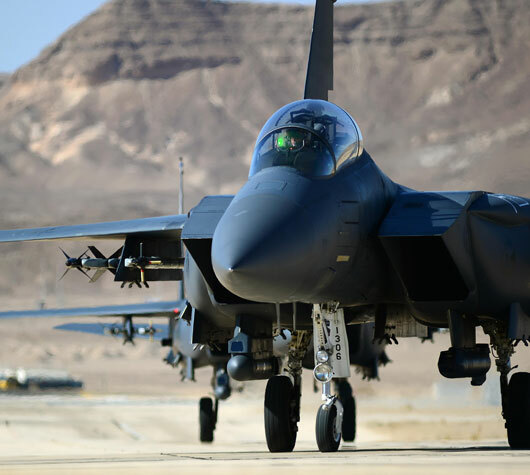 “The scenario we play here is not typical to a specific Middle Eastern country, but a generic scenario, where an air force is pitted against typical threats such as enemy aircraft in the air and on the ground, air defenses, ground targets and terror threats.“ Brig General N. said. He added that ‘Blue Flag’ exercise is similar to a certain extent to the famous ‘Red Flag’ exercise in the US, but there are certain differences here, particularly for the employment of targeting pods and ECM, contributing to more realistic training for the pilots. 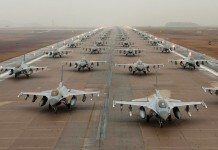 The massive exercise required special preparations by the IAF. The entire airspace south of Tel-Aviv is closed to clear the sky for the massive operation taking place each morning and each afternoon. Throughout the week, about 50 – 60 aircraft are deployed on massive air raids twice a day – in the morning and afternoon. The entire group would take off in quick succession, with jet fighters streaking through the clear sky with roaring afterburners. 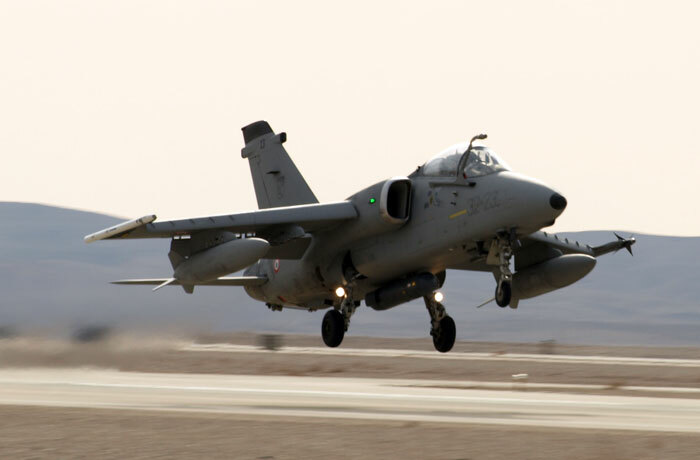 The complex operation is carefully orchestrated, distributing the fighters over multiple taxiways and runways, taking off to different directions and altitudes, thus safely separating air traffic. The location of Ouvda at the southernmost tip of the Negev desert, close to the Egyptian and Jordanian borders, leaves little room for error. To ensure that the local and foreign pilots follow these restrictions, each pilot receives taxi and takeoff instructions charted on a ‘dance card’ clearly depicting its activities on the ground and in the formation. Senior commanders from each of the air forces are rotated as mission commanders, given the mission objectives for the next raid, they also get intelligence reports, conduct threat assessment, carry out mission planning, command the operation and conduct post mission debriefing. Debriefing is shared by all teams, thus elevating the mutual learning and cooperation, using the training bases’ mission debriefing facilities. The IAF embarked on multinational training and international cooperation 15 years ago. Since those first steps in 1998, the IAF embraced cooperation with a number of air forces, sending fighter jets and pilots across the Atlantic Ocean, to exercise such as Red Flag in Nevada, and Maple Flag in Canada. The IAF was scheduled to participate in Red Flag this year, but that plan was shelved due to budget cuts in Israel and the USA. IAF officials are hopeful the Red Flag participation could be resumed in the near future. “Multinational training are capturing a growing part of our annual work plan, and the current ‘Blue Flag’ exercise is the first time we are embarking on a multinational exercise of such a scale” a senior IAF officer told Aviation Week. Other training exercises were conducted in Sardinia, Italy, Greece and Romania. In past years, when relations with Turkey were good, the IAF was frequently invited to train over Turkey and also participated in the AnatolianFlag exercise in Incirlik. In fact, foreign sources often referred to the ‘Turkish Route’ as one of the more likely options Israel might use for a hypothetical strike against Iranian nuclear facilities. However, in recent years, with the deterioration of relations between Ankara and Jerusalem, the IAF is banned from flying over Turkey or taking part in Turkish bound exercises. With that, the hypothetical ‘Turkish Route’ also dissolved. Since the cessation of training in Turkey the IAF has increased its international cooperation, adding more countries to the list. In 2008 the IAF embarked on training missions to the Czech Republic, followed by missions to Poland, Italy, Greece, Bulgaria and Romania, where five Israeli crew members were killed when a CH-53 helicopter was lost on a training mission in the Carpathian mountain range. In recent years the IAF has also embarked on long-range training missions to foreign countries, with IAF jet fighters fly to Greece or Bulgaria, and return back to Israel on the same mission. Such missions realistically represent long range strikes, with all the complex support elements, dealing with different weather systems, and flying over unfamiliar terrain.